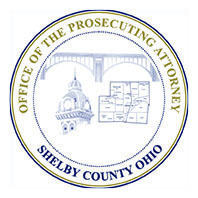 Welcome to the Office of the Shelby County Prosecutor..
Our mission is to protect the rights and well-being of the citizens of Shelby County, Ohio through effective, fair and efficient prosecution of criminal offenders and timely legal advice and counsel to county and township officials. The primary responsibility of a prosecutor is to seek justice. Our responsibility includes ensuring that the guilty are held accountable; that the innocent are protected from unwarranted harm; and that the rights of all participants, particularly victims of crime, are respected. Whether you are a victim, a witness, a taxpayer, a voter or an interested citizen, I assure you that my staff and I are at your service.